San Jose has some bad history it needs to resolve. On Tuesday, city leaders will finally decide what to do about the controversial Christopher Columbus statue at City Hall. The statue has been a fixture at City Hall since the 1950s but recently generated outrage for many in the community. At a protest over the monument on Monday, demonstrators said they don’t just want the statue gone from City Hall; they want it completely out of the public eye. 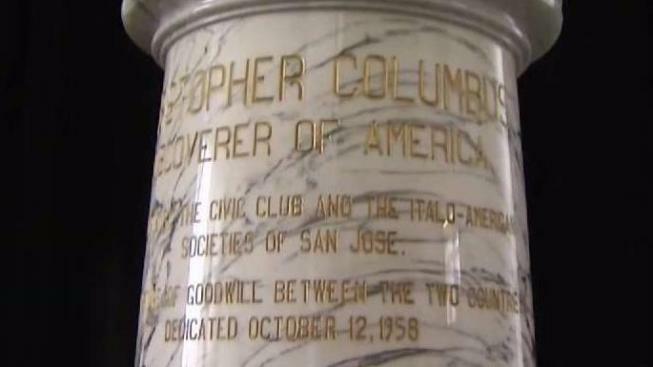 The statue of Columbus, donated by Italian American groups and the Civic Club in 1958, has been moved around periodically since it became a target of constant vandalism. Now, the San Jose branch of the Chicano activist organization, the Brown Berets, is leading a move to have it removed. "The statue kind of perpetuates this false claim that he's a man who came to this land and ... is this huge hero that founded this land and discovered this land, when in fact there were already people here inhabiting it," said Beija Gonzalez, co-chair of the San Jose Brown Berets. Justice groups such as STAND San Jose have joined the cause. "The history, the legacy, of Christopher Columbus is a history of slavery, genocide, colonization," said Jess Saba Kirchner, organizer with STAND San Jose. "So there are just lots of groups who have suffered because of those legacies." If the City Council votes to remove the statue, relocation options include Mineta San Jose International Airport and the Italian Bank exhibit at History Park. Councilman Johnny Khamis would like it at the airport, but with an updated plaque conveying a factual historical account of Columbus. "So that people could learn from history rather than trying to erase history," Khamis said. Another protest is expected Tuesday ahead of the council's afternoon session.